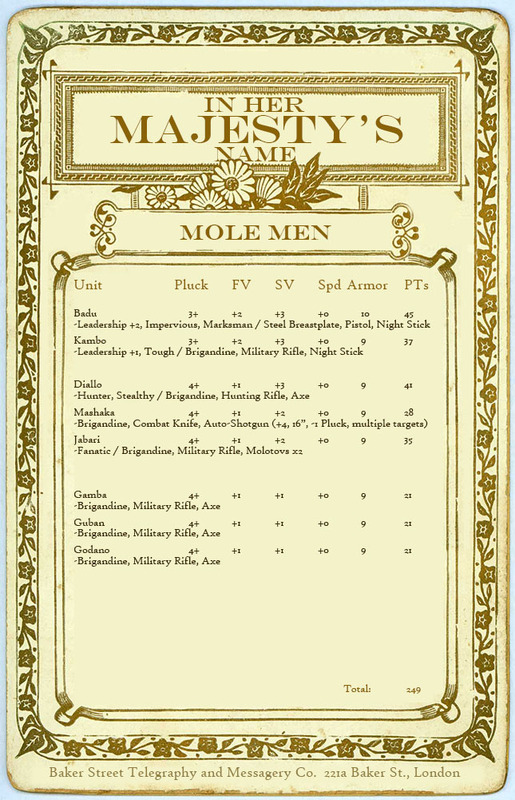 I decided to put together a Mole Men list so I could use my Quar in IHMN. I want to use my Partisans, because I think they are such cool minis. There are only 8 of them, so I made them pretty tough. I also invented an "automatic shotgun" weapon for my shotgunner. Nice Template. Is it available somewhere? Nice template btw, very period. Thanks chaps. The template isn't really a template, so much as a piece of Victorian stationery I found online and modified with photoshop. I would be happy to turn it into a fill-in-able roster sheet, but I don't know what the copyright issues might be, so I haven't done so. IHMN: Society of Thule vs. The Mole Men!